How can I batch enrol students on my groups using their student ID number? The Group Enrolment Tool is a tool for adding large numbers of students to groups that have been set up on Blackboard already. This is particularly useful where you have existing groups such as tutorial groups assigned in SI or timetable and you want to duplicate the groups in Blackboard. For adding larger numbers of students to groups (perhaps 20 or more), it is quicker to use the Group Tool rather than adding students individually when setting up groups, particularly as the student names show up in first name order. 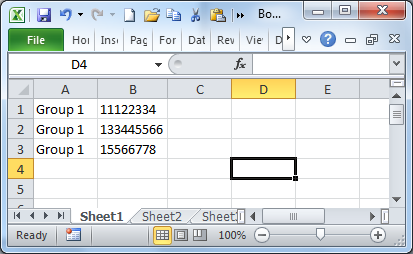 Step 1: Make a new spreadsheet file in Excel or import an existing .CSV file from SI or timetable. Group name and student number are both required. The group name must match spelling and capitalisation of the group name in Blackboard. Step 3: Save the the spreadsheet as a comma-separated file (.csv file) to a convenient location on your machine. Step 4: In the Control Panel expand the Site Tools section, then select Group Enrolement Tool. Step 5: Browse for the file on your computer. Loading the file may take a minute or so to complete depending on the number of students. If the process times out, try splitting the file into multiple parts and doing it with one part at a time. Step 7: Next Blackboard will ask to confirm the names to be uploaded, showing by name those students you wish to add, and any problems with the list (such as if you included a student ID that is not enrolled on the site). Click Submit to perform the adding. (The submit button may be located far to the right off the visible page). If some names are not coming back for enrolment, make sure the groups have already been set up on your Blackboard site, and spellings and capitalisation of group names in Blackboard are the same as in the spreadsheet. How do I add or remove members in a group? How do I edit or remove a group?